After breakfast in the morning, we headed off to the famous Xi Men Ding 西门町, which has also been commonly described as the 'Orchard Road' of Taipei (Orchard Road is Singapore's most popular shopping district). 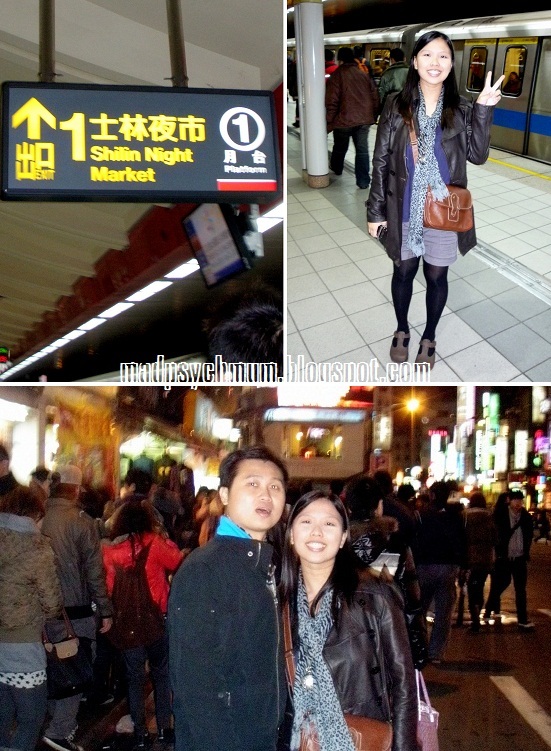 To get there, we took a train from Taipei Main Station to Ximen Station 西门站 (bound for Yongning). After many happy finds and lots of shopping done, we had our lunch at a stall selling beef noodles and rice. I know that the famous Toilet Restaurant 便所 is located here but somehow I couldn't find it. Hopefully you will have better luck. We then made a quick stop at our hotel to drop off all our things (and for me to pump) before heading out to the famous Shilin Night Market 士林夜市. To get there, take the MRT bound for Danshui on the Danshui (red) line to Jiantan Station 剑潭站 (take note it's not Shilin Station!). It wasn't too bad although not fantastic. I preferred the mee sua..
Did more shopping but we had to leave as we just couldn't stand the cold any longer (the temperature dipped to 8 degree celcius). Freezing cold! I was glad to be back in our warm beds..